iam trying to use fog client (new one) to install printers. 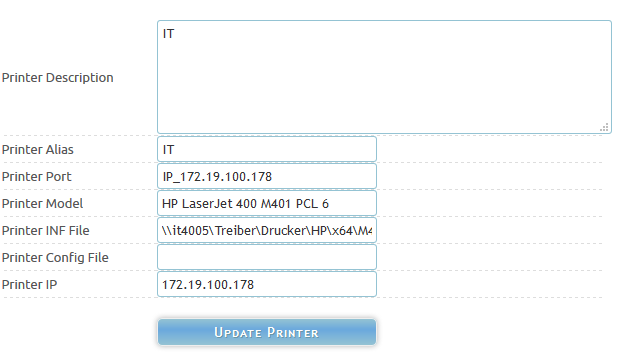 I can see in the fog service log that the printer should be installed, when i check the printers i cannot set the installed printer but when i check the available ports i can see the fog created the port IP_x.x.x.x but the printer install itself is missing. When i try to access the unc path of the printer inf showing in the log i can successfull open the share (inf). Also the Printer Model is exactly like in the inf file. Did i made any wrong inputs to the printer configuration? The command line to try it yourself manually looks like RUNDLL32 PRINTUI.DLL,PrintUIEntry /if /q /b "Printer Name" /f "path\ot\inf" /r "Printer Port Name" /m "Printer Model referenced in INF" You may want to take out the /q so you get error messages. Personally I use the following script template for each of my network printers on my base image and then remove them and use the C:\Windows\INF\oem#.inf file that gets created for each printer. You just have to watch and document which oem#.inf the pnputil adds the driver too. call :funcHead "Welcome to the Printer installer!" call :funcHead "Setting script variables"
call :funcHead "Installing Printer %~4"
echo. done installing printer %~4! Also, it sounds like this is an HP printer. I’ve had some good luck using the HP universal print driver. Within the hp universal print driver files, the inf you need is something along the lines of hpcu180u.inf With a model name of “HP Universal Printing PCL 6”(The numbers slightly change with each version of the UPD, but that’s the general structure of the file that works) But you will need all the other files from the driver in the original directory structure. In other words, you can’t just copy the inf file to the share because it will look for more files that are referenced. This is probably also the case for the model specific print driver, so if you are only putting the inf in the share, that could also be the problem. @x23piracy Just use the windows new printer install wizard and copy paste each value you have in fog into the wizard. @Scott-B how to do this steps manually, what is the client doing? is it using the ms vbs scripts for this? In the past when I have had this issue its always been the path to the driver was wrong or the driver itself was corrupt or not added correctly. Are you able to manually make a port and install a printer using all the information in the FOG configuration of the printer? @x23piracy after you see the port is created, if you reboot the machine does the printer show up in the list? First of all i have used the Printer Helper binary. Next thing Windows 10 has an embedded driver for the HP M401 and i have a downloaded one. My first attempt was to use the downloaded driver on a network share readable by everyone. This Method seems to fail because the port will be created but printer driver is not installed. Then i tried the embedded one and i have the same issue port is there but printer itself not. I have used exactly the information given the printer helper program. Can maybe someone of you test this with a windows 10 machine? @x23piracy It might be worth noting here that if you want the printer to use specific drivers, install it manually using the drivers you want, and THEN run the printer manager helper. @x23piracy I have to be honest, that video is from 0.12 version of FOG and probably the same version of the client from between all of them. The new client is New and it’s labelled as such for a very specific reason. @jbob wrote the new client more or less from scratch. He also built the printer manager helper that he linked which will tell you EXACTLY what to place for the printer definition. Why not just take it for a spin? We’re not telling you information to spin you on your head, rather to help you get to the tasking you needed to reach. Have you used the exact output of printer manager helper? It detemermines all of that for you. I know there’s only 1 entry in the ntprint file on newer versions of Windows but thats fine. That’s the reason i tried the share (readable by everyone, checked the inf for the right name and took em) with a downloaded driver for the device from hp. If you install the HP M401 under windows 10 by adding the port and driver autodetection it installs the embedded driver but i don’t know howto locate the names and the correct inf under windows 10. @x23piracy I’m not aware of any videos in the wiki about printers. Can you give a link? @Arrowhead-IT @Jbob the share is readable by anyone (anonymous) a can also place the driver on the local system even then it will not install only the port is created. @Wayne-Workman i tried the printer manager helper and on my productive windows 10 i used the embedded driver that windows 10 brings for the hp m401 and not the one on the share. The strange thing is the helper tells me that the ntprint.inf was used on my local system for the driver but when i open the ntprint.inf i cannot find the entry the helper is showing for the printername. Thats the reason why i tried it with a dowloaded driver from hp in the share i used. In the wiki example video i can see a lot of entrys for printer names in ntprint.inf but under windows 10 there is not a single entry but if you create network ports it automatically detects the driver and uses the embedded one, how to locate the right drivers names for embedded printer driver in windows 10 like the wiki video is showing? I believe @Arrowhead-IT is on the right track. The share must be configured for anonymous read. @x23piracy Does the share require a login? If it isn’t a public share it probably won’t work. hey tom and wayne, i missed your answer before ;) thank u for the reply. Tom i will update and report back, wayne i will try that thank you and get back to u guys. Also, could you try updating to the latest?